I still bought the Discman. Even then, I understood this as an iteration of your devotion to our family. It was always apparent that you treasured your job as our dad, and truly enjoyed the time we spent together as a family. No silly little device would come between us and the adventures we had to make together. I already dread the future struggles against my kids wanting their own devices of “solitary activity,” which are, perhaps, even more ubiquitous today. But I hope that when we do run up against these tides we cannot avoid, my kids will, like me, have little issue not allowing these items to take away from our times together–because the family times beat anything a device could provide them on their own. I plan to share some more of my dad’s wisdom here, because there’s no doubt he’s truly lived a self-styled life full of adventure! But for now, I hope you enjoy that little snippet. And thanks to the New Hampshire Writers’ Network for inspiring this memory–click on over to hear some more dad wisdom! 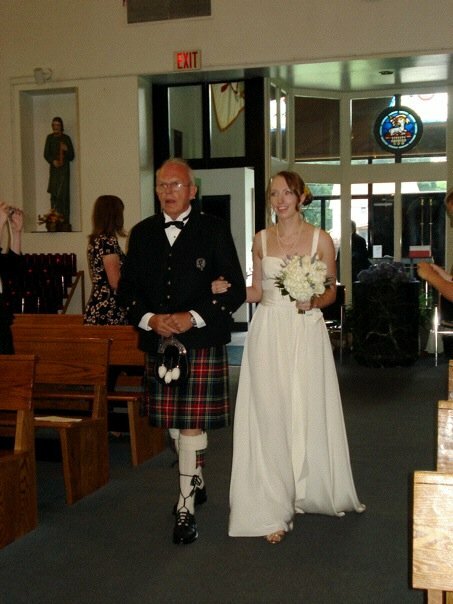 My Dad and I at my wedding! What memories or lessons do you treasure from your dad? i like that…. a primitive Ipad. Lovely memories. My mum was the boss growing up. Dad was easy to convince 😉 he’s still my go to man for so many things.